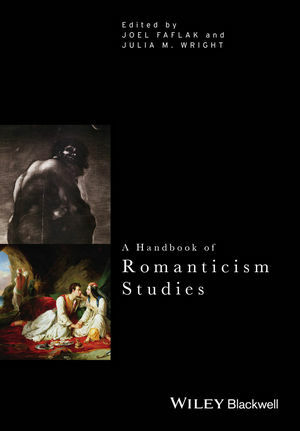 The Handbook to Romanticism Studies is an accessible and indispensible resource providing students and scholars with a rich array of historical and up-to-date critical and theoretical contexts for the study of Romanticism. Joel Faflak is Associate Professor of English and Theory at the University of Western Ontario. He is author of Romantic Psychoanalysis: The Burden of the Mystery (2007), co-author of Revelation and Knowledge (2011) and editor of Sanity, Madness, Transformation: The Psyche of Romanticism (2005). Julia M. Wright is Canada Research Chair in European Studies at Dalhousie University. She is the author of Blake, Nationalism and the Politics of Alienation (2004) and Ireland, India, and Nationalism in Nineteenth-Century Literature (2007) and the editor of Irish Literature 1750-1900: An Anthology (Wiley-Blackwell, 2008) and the 2-volume A Companion to Irish Literature (Wiley-Blackwell, 2010).